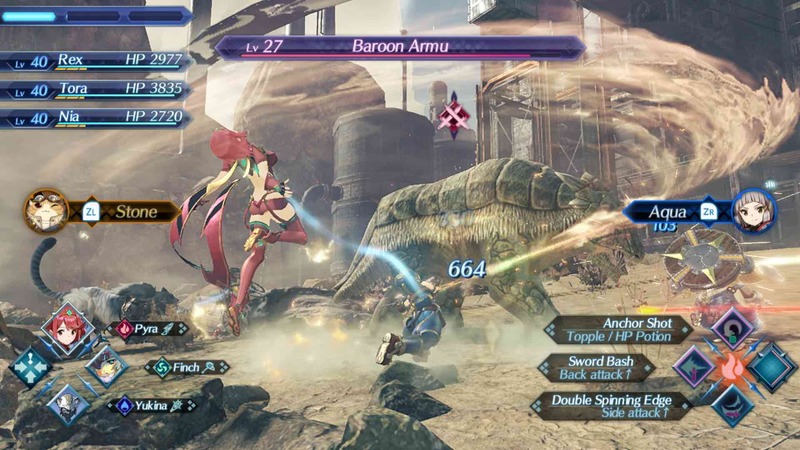 Improving the Battle System in Xenoblade 2 – What's in a Game? While I absolutely love the strategy in the battle system, I had trouble enjoying common encounters during large portions of the game. I often found battles boring and confusing. Let’s explore the reason why and what we can learn from this. Is the battle system too complex? I want to say no because for every new mechanic introduced, it adds a good number of interesting decisions that add depth to the gameplay. Since mechanics are required at good intervals in the game, it gives players time to learn each mechanic. I still have to wonder if all the complexity was necessary. A good rule in game design is to only add as many mechanics required to make the game deep. More mechanics only increase the complexity for the player to comprehend. Instead, games should rely on only a few mechanics interacting with each other in natural ways to perform synergy. Mario Odyssey and Zelda: Breath of the Wild are great recent examples of synergy creating deep gameplay. Could the game be better at teaching you mechanics? Tutorials spam you at the beginning of the game with tons of information and can never be watched again. In order to learn the mechanics, I mostly had to rely on researching online and then practicing. I explore how the game teaches you mechanics and how it could do it better here. Do common encounters take too long? At level 21, I went back to kill a level 12 unique monster. It took over three minutes and I was never in any danger of dying. I believe if the player isn’t in danger of dying or losing resources, the player’s time shouldn’t be wasted. In normal gameplay following the main story, I found myself avoiding encounters take too long and require too much thought. It’s great in short bursts but gets tiring with as many encounters that exist. Are battles too slow at the beginning? The beginning of a battle is slow because you can’t make any decisions besides where to stand. You must wait for auto attacks to fill your arts gauges before being able to make any choices. This specifically draws out common encounters longer than necessary. Overall, I wonder how much the experience would’ve changed by being able to perform your arts at the beginning of a battle. I would imagine it would make common encounters faster and barely change boss fights (or any lengthy fight), so it sounds like a good compromise. It would also give fidgety players something to do from the start to mitigate the boredom of not being able to move. Are there too many enemies? Instead of making common encounters easier, they could reduce the quantity. I would prefer this. Then, we can keep the strategy in common encounters, while reducing time spent. One could argue that because most enemies are easily skippable, the designers, wanting the world to be full of life and monsters, meant for players to get bored of battles and skip enemies when they got bored. I doubt this because I skipped a large portion of battles and felt under leveled a good portion of the game. Let me set up my party that sets me up for the strategy I want to use! The abilities and elements players can use are largely determined by randomness. This interferes with which strategy players can actually apply. I often found it frustrating that I couldn’t use the elements or weapons I wanted. This was one reason that caused me to skip some common encounters. I discuss randomness in this game in detail here. Let me control my party member AI! You only have two ways to control your AI, when to use their special of the Blade that they are currently using and to target the enemy you are targeting. Say I want to perform a Blade Combo of a specific element. I need to wait for my party member to change to a blade that has an element I want. This is very frustrating for players because the action they envision performing is being blocked by party member AI – who are supposed to be your friends! The same thing happens with Driver Combos, healing, and prioritization of increasing special level. Allowing some control over the AI would make it easier to turn their strategy into reality and put it to the test against the enemies. Give the AI commands in battle – “Focus on healing” “Focus on building affinity for specials”. They may run into problems with how to let the player control this on the UI. A way to select which blades they are using. FFXIII’s Paradigm shift mechanic comes to mind, letting you change the jobs of your party members on the fly in battle.